Disciplines have their own vocabularies, and these may sometimes appear obscure to people who peek into the new areas. My word-processing package used to tell me that it didn’t recognise “historiography” as a word, for instance. We historians use this word, which denotes the study of historical interpretations, rather frequently, and we normally begin our academic studies with an historiographical discussion in order to situate our analysis in the context of previous studies of similar questions. So my computer was wrong to insist, with its dramatic red underlining, that “historiography” was not a word. But more surprisingly, it has stopped doing so now. Someone, and I know it wasn’t me, must have told Microsoft Word that this is a fully acceptable English-language term. But its built-in dictionary still doesn’t know what it is. When we began working with computational linguists on this project, one word that really stuck out for me was “bootstrapping.” Not surprisingly, I had never come across some words and acronyms that computational linguists use. “OCRed data,” for instance, is one example. But such acronyms and their usage made sense once I learned them. Bootstrapping was somewhat different: I knew this was an English word, so I did not mentally have to underline it in red. The phrase “pull oneself up by one’s bootstraps” was familiar, at least grammatically, even if it does seem illogical and impossible. And I could visualise what a bootstrap looked like. But I didn’t fully understand how it fit into the sentences we exchanged – it was not a word, after all, that I used very often. In contrast, computational linguists seemed to bootstrap fairly frequently, or at least their sentences did. As an outsider, it seemed rude to ask the meaning of words that I thought I should know. Fortunately, Jim Clifford explained the term to me: teaching the computer to teach itself, to pull itself up by its own bootstraps, I suppose. The processer should recognise when a new circumstance occurs, and then apply that rule when it next encounters the same issue. Or as the Wikipedia entry puts it: “a self-sustaining process that proceeds without external help.” In this context, we humans are, I guess, that external help. Bootstrapping struck me as a key component of the approach that computational linguists take to their studies. The importance of “bootstrapping” for this project led me to wonder if some of the people whose writings we were studying used the word. So I decided to check the Early Canadiana On-line collection. A simple word search turned up only one instance. (Of course I know that such a search may have missed many references in the documents that were poorly OCRed – see how quickly I caught on!) The one example appeared in an 1884 issue of the Canada Medical & Surgical Journal (p. 496), which reprinted an article from the Journal of the American Medical Association on the topic of a “New Form of Saddle-Crutch.” This saddle-crutch used “boot-strap webbing” made of leather which allowed the user, in this case an over-weight man with a fractured leg, to vary the height of the crutch. Image of the “Saddle Crutch” – with thanks for Canadiana.org. There undoubtedly is an appropriate metaphor about the merits of “bootstrapping” as a way of dealing with over-sized subject material, such as the vast amounts of printed data that we are attempting to study in the Trading Consequences project. During the 19th century British industrialists and botanists searched the world for economically useful plants. They moved seeds and plants between continents and developed networks of trade and plantations to supply British industries and consumers. This global network also spread diseases. Stuart McCook is working on the history of Coffee Rust (Hemileia Vastatrix) and there are a few books that examine the diseases that prevented Brazil from developing rubber plantations. 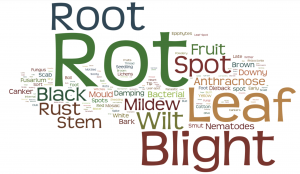 Building on this work, we’re using the Trading Consequences text mining pipeline to try explore the wider trends of plant diseases as they spread through the trade and plantation network. We need a list of diseases with both the scientific and common names from the time period. The Internet Archive provides a number of text books from the end of the 19th and start of the 20th century. They were written by American botanists, but one book in particular attempts a global survey of tropical plant diseases (The Diseases of Tropical Plants). Because these books are organized in an encyclopedic fashion, it is relatively easy to have a student go through and create a list of plant disease. We’re working on expanding our list from other sources of the next few weeks. Once the list is complete we’ll add them to our pipeline and extract relationships between mentions of these diseases, locations, dates and commodities in our corpus of 19th century documents. This should allow us to track Sooty Mould, Black Rot, Fleshy Fungi, Coffee Leaf Rust and hundreds of other diseases at points in time when they became enough of a problem to appear in our document collection.